People usually buy newly released Android phones to experience the latest technologies and of course they do not want to lose their data during the switch. The increasing use of WhatsApp in day-to-day communication and rapid growth of Android smartphone has made it necessary to know how to transfer WhatsApp messages/chats history from Android phone to Android. This will help us migrate WhatsApp data seamlessly to the new Android phone. Unlike other messaging apps that backup all chats and messages on cloud, WhatsApp uses local storage to save the backup file. This means the local backup is kept on your Android phone. WhatsApp automatically backup WhatsApp chats and messages at the 2 a.m. each day. The current chat messages will be deleted if you chose this method. Here are the steps on how to transfer Android WhatsApp messages to a new Android. Step 1: Install a file manager app on your old Android phone. Step 2: Open the app and navigate to sdcard/WhatsApp/Databases. Step 3: Rename the backup file like msgstore-YYYY-MM-DD.1.db.crypt12 to msgstore.db.crypt12. And copy this file to the new Android phone. Step 4: Install WhatsApp on the new Android phone and verify the phone number. Then tap 'Restore' and select the file you just copied from old phone. All WhatsApp messages will be transferred to new phone. 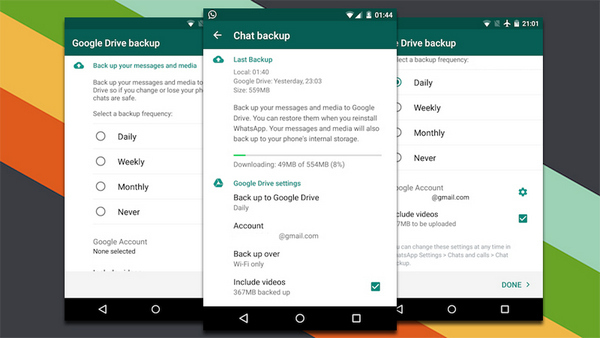 Google Drive is the way recommended by WhatsApp official for message backup. It will keep the backup up to date and can be restored more easily than local backup. This is a nice way if you use Google service extensively. 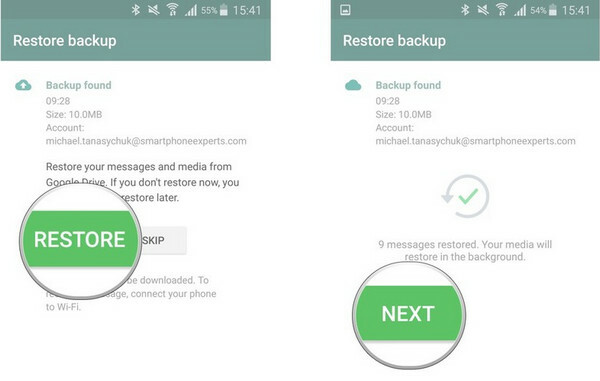 Here is the how-to guide for WhatsApp message backup and transfer. Step 1: Add Google account on your old Android phone and sign in. Step 2: Launch WhatsApp on the phone and go to Settings -> Chat -> Chat Backup. Step 3: There is an option called 'Back up to Google Drive'. Tap on it and select a Google account. A few minutes later, all WhatsApp messages and chats will be uploaded to Google Drive. Step 4: Install WhatsApp on the new Android phone and Tap 'Restore' during setup. Step 5: Choose Restore from Google Drive and login Google account. When everything goes well, the WhatsApp messages will be synced to new Android in less than 10 minutes. Though all of these methods can be used to transfer WhatsApp messages from one Android phone to the other but the last one is considered the best and the safest of them all. 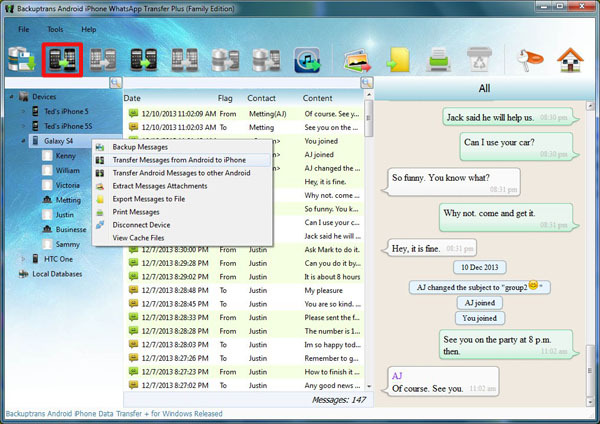 So if you have recently switched from iOS or the mobile phone running on Android OS, then you can use Androidphonesoft WhatsApp Transfer Plus for transferring WhatsApp messages from your old phone to the new one. More information is provided in below. Download and install the software on a computer first. Run the software on your computer after installing it. Now use a USB cable to connect both the old Android phone to PC or Mac. Make sure USB debugging is enabled on both Android phones. When the program detects your phone, a message will pop up on the screen of the phone. Simple tap 'Backup my data'. Then click on 'OK' button on the software on your computer to proceed further. You can add a password for the backup for security reason. A few minutes later, all WhatsApp messages and media are backed up to computer. Connect the new Android phone to computer and Click on the list of WhatsApp message you want to transfer. Now press on the button 'Transfer Android Messages to Other Android ' on the top tool bar of the program or simply right click the devcice name. Then all WhatsApp messages will be copied to new phone. Alternatively, WhatsApp messages can also be transferred from one Android to the other just with a single contact. Click on the old Android device name on left sidebar and click on the contact name. Now turn to 'Transfer Messages from Android to Other Android' button on the top tool bar and press it to transfer selected WhatsApp messages from one Android to the other. The third method will transfer all-up-to-date messages and chats from one Android to another without losing a single message. So it is the recommended way for safe WhatsApp messages migration. In addition, you can also transfer Android WhatsApp messages to iPhone in the same way. Besides transfer, it is also capable of WhatsApp backup, attachment extraction and message printing.